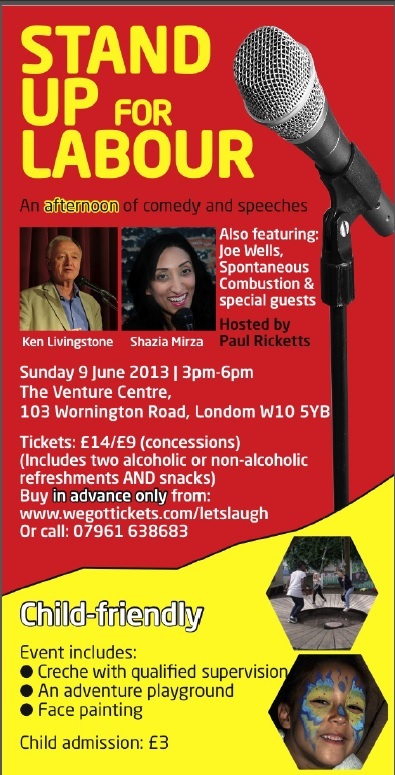 Roving comedy show Stand Up for Labour is coming to North Kensington on Sunday 9 June, details below. Fun for all the family with a supervised creche and drinks included in ticket price. Tickets online (details below) or from Crispin on 07961638683 or Lizzie on 07587 955888. TICKETS CAN NOW BE BOUGHT ON THE DOOR, £10 TO INCLUDE TWO ALCOHOLIC OR NOT DRINKS AND SNACKS.